Our Kitchen Fitters North London are responsive to all your needs and we listen to all your ideas, we pay attention to all the details concerning the kitchen that suits you best. 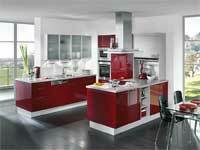 A creative and functional kitchen design and installation is as important as the selection of quality products. We make sure your cabinetry is installed properly and all the units are comfortable for use. We offer home buyers the chance to create the kitchen of their dreams because every kitchen is as unique as its owner. We Can Design, Fit and Install Your Dream Kitchen! Simply Dial 020 8363 8072 Now For More Information!